In any management system related to safety, prevention and specialized response applied to an area, location, region or country, there must be at least five sequential and logical stages that allow the proper development of the system. The first stage is the baseline study, which is nothing more than the initial picture of what is being developed at the time, the same one that we could answer with two questions: What logistical and human resources are available? And, what is the country's condition, geographic location and geopolitical landscape? The second is risk analysis, which involves knowing the area being studied, understanding what the main hazards and risks are, in order to modulate their impact against a set of possible undesired events. As a third stage, we have the development of contingency plans - although there are safety, operation and emergency plans - it is necessary to have a great plan that covers us in the face of potential events, such as a lack of or scarce quantity and quality of resources, the limited availability of personnel and/or social context. If we have a contingency plan, we will have the appropriate route to offer a response according to the needs. Training and practice are just as important as the previous stages, which will be developed optimally after having done all the processes described above. If the training is rigorous, then it will benefit us in the creation of a relevant curriculum and according to the needs of the industry. For the creation of this curricular plan, it is essential to take into account information on risks, dangers, resources and response capacities, not only internally, but also externally (local, regional, national and international). Likewise, a standardized language will allow interaction with other external organizations. Once this stage is finished, we must consider the development of simulations and mock sessions, which must be held in accordance with the tools proposed at the beginning of this article. The main purpose of this last stage is to be able to prove, in a real and effective way, if everything planned, created and developed in the initial plans and training will work at the time of the emergency. For this, a simulation involves the development of tools that include procedures, protocols, plans and forms that organize a simulated response in a room, in front of a hypothetical case with geographic area, logistical and human resources, previously recorded in a manual or guide that allow the participant a freedom of decision limited to a limited amount of resources, making this parameter a more real exercise. The simulations must be unannounced (with prior notice and without notice). This allows us to analyze the real capacity of response, not only at the strategic level but also tactical and operational in emergency situations. A serious evaluation of the simulation will allow us to know if the available resources can really respond to immediate needs and to what extent they can cover the undesired events already estimated in the risk analysis. Likewise, it will help us verify if the plan of contingencies goes according to what you have and if, after all, it will be effective during the emergency. Each stage, one over the other, fulfills a fundamental role and omitting it, would have negative consequences for your safety, that of your collaborators and the environment, so it is essential to have a specialized team to guide with rigor and efficiency, each one. Remember that you are a corporate citizen and, as such, have rights and duties, safeguard the chemical safety of your company and environment, is one of them. Mr. Aguero, is a Commander of Peru's General Corps of Voluntary Firemen, where he has an active role in the the elaboration of Levels of Emergency Response for Hazmat incidents. 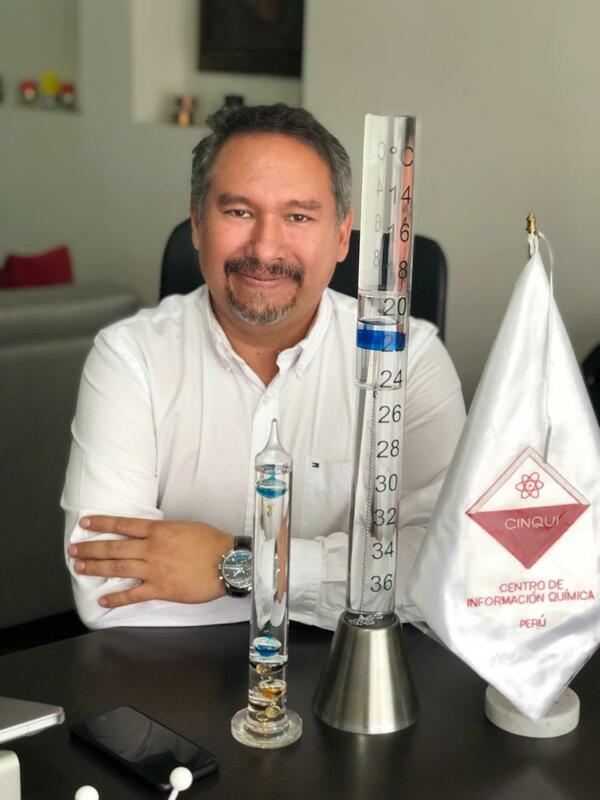 He is also involved CBRN Emergency Response and Safety inspection at the Peruvian Institute of Nuclear Energy, as well as in training and consulting activities with several local and international bodies, including training workshops in Chemical Safety at OPCW. He cooperates with Peru's Armed Forces and National Police for the instructions of agents specialized in emergency response for incidents involving Hazmat material.